Robyns Simple Life: All A Bloom! 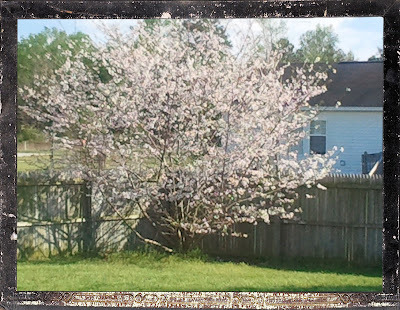 Springtime has finally hit my blood...Today was a simply gorgeous day.. Near 60, beautiful blue skies with big puffy white clouds that looked like cotton.... My beautiful Cherry tree that Mr L. planted for me when we first moved here is all a bloom.. This was the only tree I've ever asked for or ever wanted.. When I was a little girl, we had a huge one in our backyard.. So big that it's branches reached over to the house. 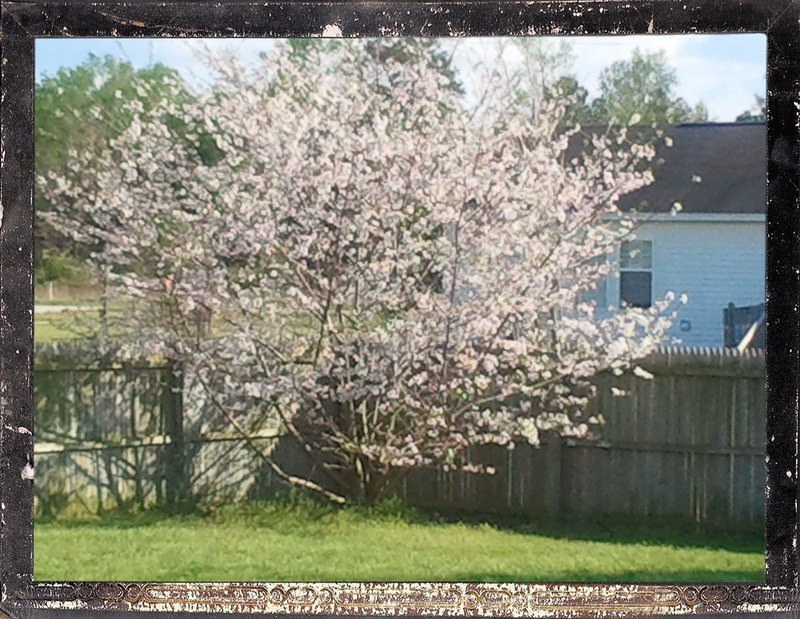 Each year on my birthday I would wake up and that tree would be all a bloom with those pretty pink flowers. So when we moved here I wanted something that reminded me of my childhood home.. It has a long way to go before it will be near as big as the original but when I look at it, I remember and those are good memories.. This morning I decided I needed a little retail therapy. Not something I do often but, everyone once in a while a girl just has too.. 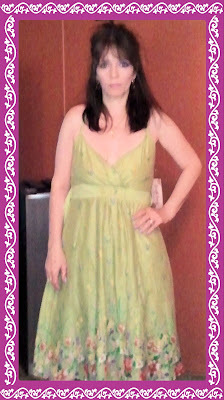 I went to a store called Burkes Outlet near my home and I picked up my dress for Easter Sunday Mass. Sorry it's so blurry, Mr L. doesn't do so well with the camera..the best part? The dress only cost me $9.99 on clearance! Then I was perusing the isles as I have never been in there before an I spied kitchen decor!.. I have this thing with Roosters.. I love them.. We have our own chickens and Roosters and my Rooster "Hank" is just beautiful. One day I will post a picture of him for you to see..Well Hank, is the reason for my love of all things Rooster.. As I was walking down this one isle not really impressed with what I was seeing, I found these! 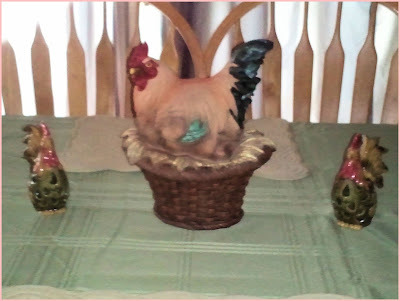 I have been looking for a pretty Rooster for my dining table but either they were ridiculously expensive or I didn't like them.. but I really liked this guy! and then I bought the two little Roosters to keep him company..
Then it was off to the dollar store.. I needed to buy some bins for the kitchen and some for the bathroom and I realized it was time to change out the flowers in my Mason jars in the living room.. 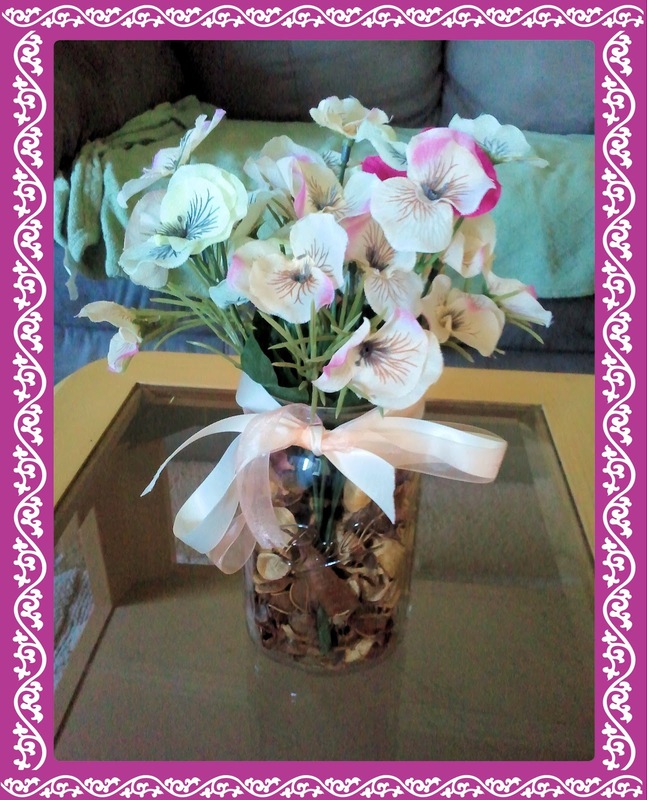 So I got a tiny bit crafty this afternoon an here is what I came up with.. The Mason jars I already have, I bought some Vanilla scented potpourri (doesn't smell all that great, what do ya want for a buck) , some ribbons, and some fake flowers..I made two and I think it cost me all of 8 dollars for both of them..
That was my spring day today..and I really enjoyed it... How about you? Love the dress and the flower arrangement is beautiful. Love love love the dress! We don't dress up at all where I go to church. Some of the older folks do because when they were growing up you had your Sunday best. We are just grateful people come! My DIL has a thing about roosters too. Lots in her house. Hoppy Spring! Yes, it has been beautiful here--I especially loved this past Sunday!! Do you realize it is supposed to be around 86 on Thursday!!! YIKES! Looks like you had a lot of fun! There are some roosters (not for sale) at the Eggs up Grill near us That I love! Show us a picture of your real rooster--hmm, how does he survive with all those dogs! Love the dress, what a steal! And your cherry tree is gorgeous, I love that you planted it because it reminds you of your childhood. So sweet!